Dorothy (Dot) Beaucar Celebrates Living in Bristol for 100 Years! In 1919, Bristol had only been incorporated as a City for eight years – established as the town of Bristol in 1785 after being part of Farmington and called New Cambridge. The day that Dorothy (Dot) Beaucar was born, Wednesday, March 5, 1919, the headline of the Bristol Press read, “Government Will Not Relinquish Railroads.” Advertisements in the paper that day included one from South Side Market, located on Main Street advertising steak for 27 cents a pound and eggs for 60 cents a dozen for sale at Regan’s Butter Store, located on North Main Street. In March of 1919 you could also pre-order a Ford Universal Car from Elmer Automobile Company, located on Main Street – a Runabout would cost you $500, a Touring Car would cost you $525, a Coupe would cost you $650, and a Sedan would cost you $775. Life-long Bristol resident, Dorothy Beaucar grew up in a home on South Street – she was one of four children with a large extended family living in Bristol. Dot attended St. Joseph School for grades one through eight and then began high school at Bristol High School in the building which now houses the Bristol Historical Society located on Summer Street – all freshmen began high school in this building and then moved over to the new high school, which was built in 1920 on Memorial Boulevard, to complete their sophomore through senior years of high school. In 1936, upon graduation from Bristol High School she worked at a Five and Dime store located in Downtown Bristol where you could purchase a pocket watch for $1.00. In 1937 she went to work at Ingrahams Clock and Watch Factory doing administrative work – a job she held for 50 years until she retired in 1987. After Dot retired she volunteered, giving back to the Bristol community in many capacities over the course of the last thirty plus years. Dot never married, but has many relatives and a large circle of friends in Bristol. She is still going strong and continues to volunteer on a regular basis at the Chamber of Commerce and the Bristol Senior Center – caring for people in the community who are younger than she is! When not doing volunteer work, she enjoys painting and is the illustrator of a book. As a parishoner of St. Joseph Church she volunteers as a member of the Funeral Ministry, she sews all the baptismal robes for the Church’s baptisms, and bakes for fundraising events held at the Church. In addition, she has made over 1,000 diapers for babies in Haiti. 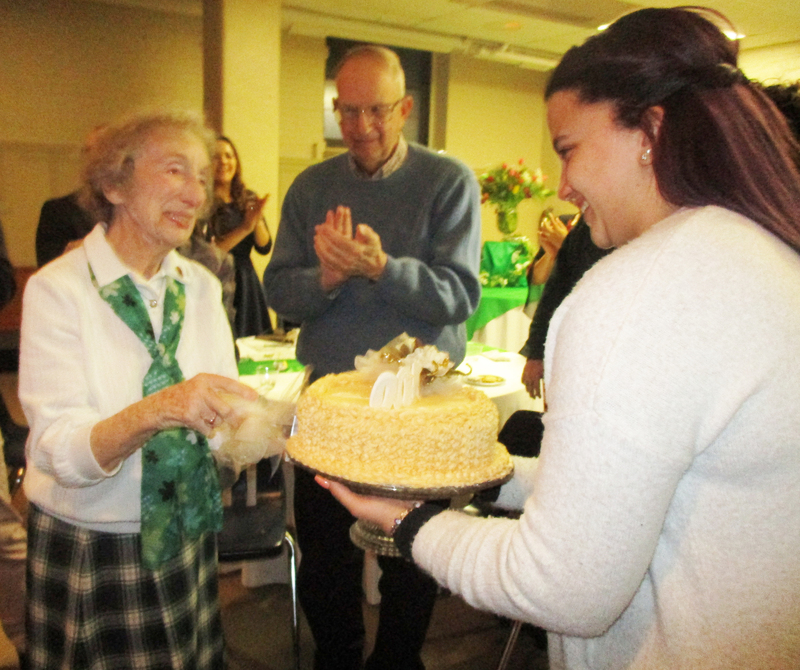 Dorothy Beaucar cuts the cake at her 100th birthday celebration with family and friends. 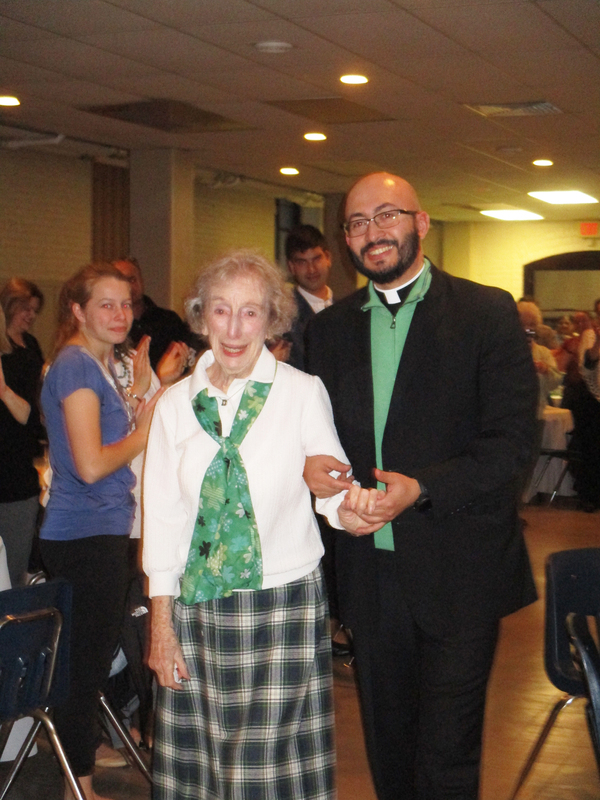 In 2013, Dot received the Archbishop’s St. Joseph Award for her many years of volunteer work and in 2018 she was recognized by the Malta House of Care receiving the Wonder Woman Award. On March 16, the Bristol community came together after mass at St. Joseph Church to honor Dot for turning 100 years old. Many Bristol residents, business people, along with the Mayor attended the celebration to wish Dot a happy birthday. Mayor Ellen Zoppo-Sassu read a proclamation from the City of Bristol and presented Dot with a Bristol All Heart Award to thank her for her many years of volunteer service to the Church and the Bristol community and to recognize her for reaching this milestone 100th birthday.